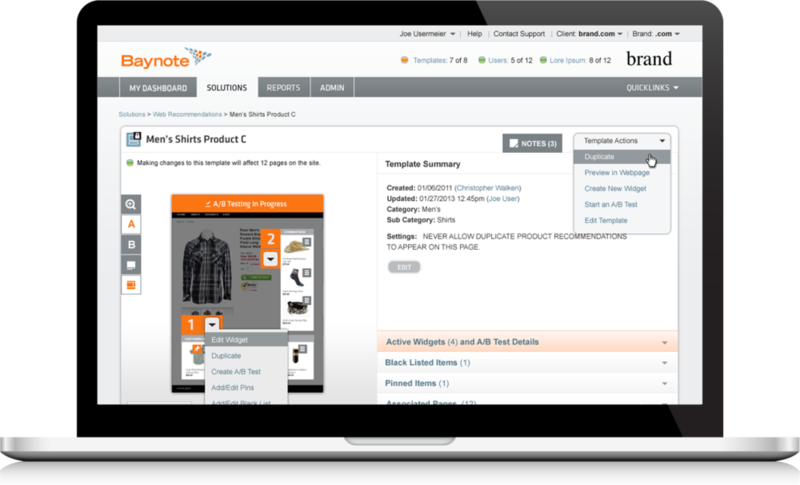 Baynote, had a powerful recommendations engine that delivered a personalized experience for their retailer customers’ consumers, but retailers had a difficult time configuring the engine without the help of Professional Services. 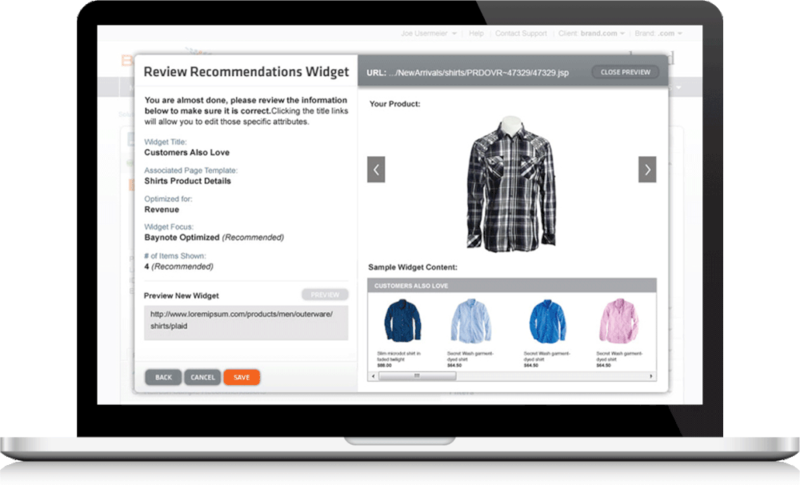 They engaged Busse Design to create a user-friendly interface that could easily be configured by merchandisers; provide high-level reporting and analytics for infrequent users, which could also be accessed via a tablet; and create a scalable framework that would accommodate new solutions in the future. After an intensive Discovery session where Baynote’s Professional Services team walked us through the web application, we evaluated the application’s terminology for key concepts and found that they were geared to developers. We presented a new conceptual paradigm that would resonate with merchandisers and presented a more intuitive overarching application structure in the form of an Application Map. We then worked through the major workflows to completing core configuration tasks in the application by providing flow diagrams and wireframes. Once these were approved by the client, we participated in Baynote customer interviews using a clickthrough prototype of the revised application. We then made minor modifications to the flows. In addition to improving usability by addressing the overall interaction models, Busse Design provided a new look and feel for the application that leveraged Baynote’s corporate branding guidelines. Once Baynote approved the wireframes for the application’s page structure and framework, our graphic designers provided various visual design concepts to choose from. The goal of this design was to create a clean interface that would integrate well with any retailer’s websites and products that would be pulled into the application. After Baynote selected a design direction, we created the graphics for the remaining application templates and provided functional front-end HTML templates, using HTML5, CSS3, and jQuery. 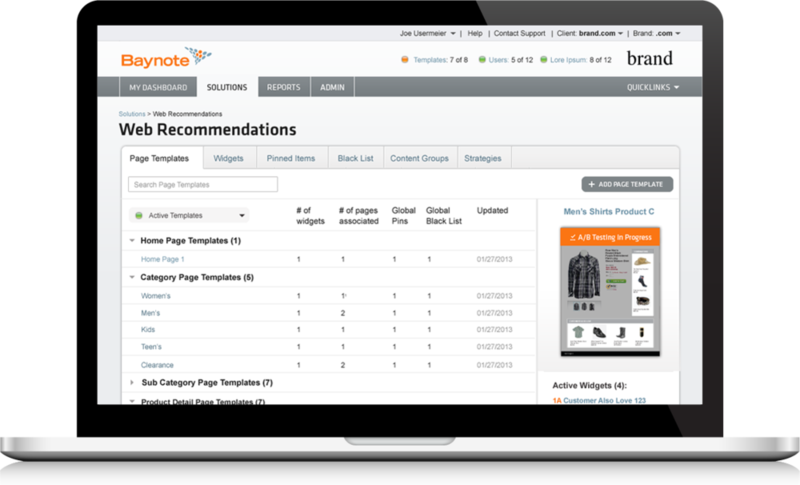 In the end, Baynote was able to deliver Baynote VUE, a powerful, user-friendly recommendations engine that can easily be configured and managed by merchandisers.